ASI/SILICA Machinery’s Dual Spindle system provides optimum control over chemical vapor deposition in an atmospheric environment. The system can be used for the silica soot deposition process in the manufacturing of either pure fused silica or the overcladding of OVD, MCVD, PCVD, or VAD core preforms. Each machine can make 2 preforms at a time. The system is made of highly engineered components and is designed to operate reliably with repeatable results. The Dual Spindle System is available as an upgrade to already existing ACVD18 models or as a new stand alone machine. 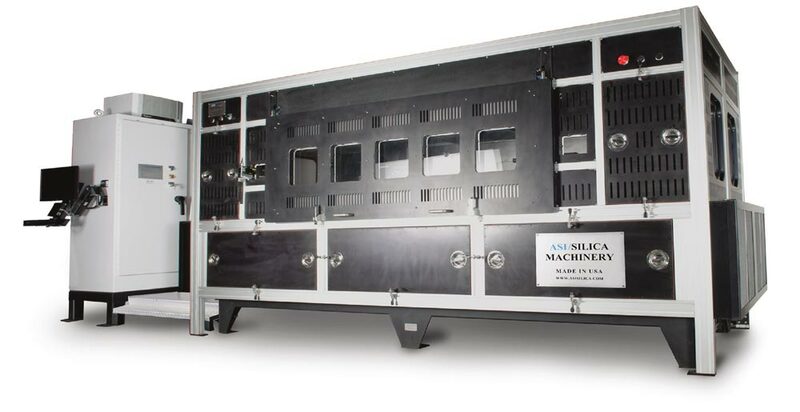 The chemical delivery system continuously delivers SiCl4, 02, and H2 to generate silica. The system is helium leak tested to a level of 1×10-8 std cc/sec per fitting. The gas delivery system is made of electro-polished 316 stainless steel components, assembled in a class 10 clean room environment and equipped with a sub-micron filters to insure the highest level of purity. The system incorporates a series of mass flow controllers and air operated diaphragm valves. Upon completion, the system is helium leak tested to a level of 1×10-8 std cc/sec. The system has a specially designed reaction chamber, made of stainless steel and lined with corrosion resistant materials for protection. The reaction chamber is equipped with a pre-filter, Hepa filter and variable speed blower, to maintain a clean-air environment within the chamber. A flow sensor within the cabinet assures proper ex-haust flow during operation. The work area is illuminated by a pair of fluorescent lamps. All the process parameters are monitored and complete process control is achieved using an industrialized personal computer. Run data,including work piece diameter, is displayed on the screen for easy monitoring and automatically stored on the hard drive for process analysis and trouble-shooting. (equivalent to 118-150 mm glass preform).